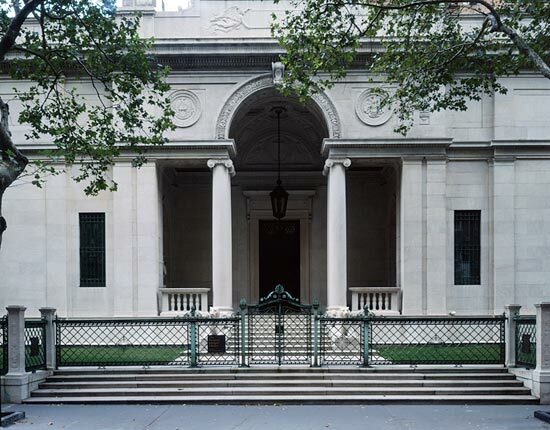 For the exterior, McKim used Tennessee pink marble in a classically simple design: a rectangular structure with a recessed portico. 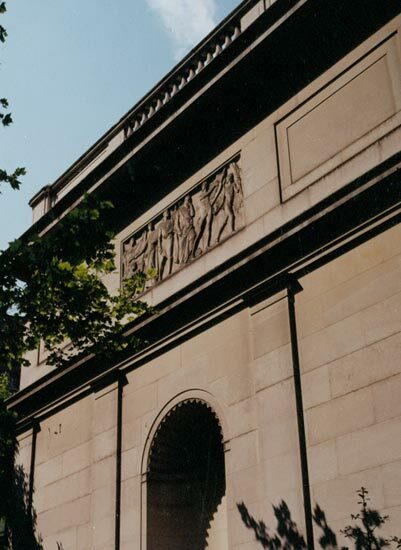 Six Doric pilasters on either side establish the rhythm of the façade and disclose the interior organization; the entrance is accentuated by paired double Ionic columns. McKim drew on two sixteenth-century Roman sources for the façade: the attic story of the Nymphaeum (the garden loggia) of the Villa Giulia, designed by Bartolomeo Ammannati for Pope Julius III (ca. 1554); and the entrance to the Villa Medici, built by Annibale Lippi for Cardinal Ricci (ca. 1544). McKim's devotion to the Renaissance and its basis in classical antiquity is apparent in the construction as well as the design of the library: the marble blocks were fitted together in the anathyrosis method of classical Greek architecture, with a minimum of mortar. Several artists created the exterior decorations. Andrew O'Connor (1874–1941) executed the angel-borne dedicatory panel on the cornice and, above the bronze doors, the sculpted lunette with two putti supporting the logo of Aldus Manutius, the great Renaissance printer and scholar. Adolph Weinman (1870–1952), a student of Augustus Saint-Gaudens, sculpted the allegorical reliefs on the façade. Above the central bay of the west wing, Music (or Apollo), accompanied by Fame, inspires the arts of Architecture, Sculpture, Painting, Ceramics, and Textiles. On the east, Truth leads Literature, Philosophy, History, Astronomy, and Oratory. The sleek Assyrian lionesses that guard the stairs are the work of Edward Clark Potter (1857–1923), who was in the studio of Daniel Chester French. Potter would later create the stately lions that defend the terrace of the New York Public Library.